MATROX Imaging has announced Odyssey XD, the newest member of the Matrox Odyssey family of vision processors. Matrox Odyssey XD integrates the latest off-the-shelf and custom technologies with an established, fourth-generation architecture to deliver unprecedented performance and value. Matrox Odyssey XD is powered by the freescale "G4 PowerPC" embedded microprocessor and a state-of-the-art Oasis processing and router ASIC. Matrox Odyssey XD features 512MB of DDR SDRAM memory, up to 1GB per second of external I/O bandwidth, over 5 GB per second of memory bandwidth and performs up to 130 BOPs. 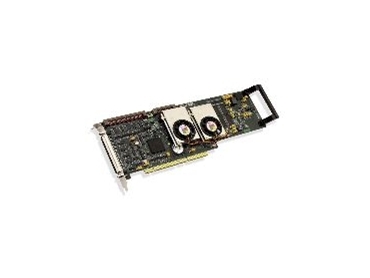 Available from the Dindima Group , Matrox Odyssey XD's integrated LVDS/RS-422 frame grabber features four completely independent 16-bit wide inputs. These inputs can be configured to acquire from two, four and eight-tap monochrome sources as well as RGB sources. The Matrox Oasis ASIC is the pivotal component on all boards in the Matrox Odyssey family. This high-density chip integrates a CPU bridge, Pixel Accelerator, Links Controller and main memory controller. The Pixel Accelerator (PA) is a parallel processor core that accelerates neighbourhood, point-to-point and LUT mapping operations. It consists of an array of 64 processing elements all working in parallel. Operating at a core frequency of 167MHz enables the PA to process up to two billion pixels per second. The Links Controller (LINX) is the router that manages all data movement inside and outside the processing node, which consists of the Pixel Accelerator, CPU and main memory. It can handle several concurrent video and message streams, thereby offloading data management tasks from the CPU and PA and allowing them to focus on image processing tasks. With over 30 million transistors, the Oasis also incorporates a 128-bit wide, 167MHz double data rate DRAM interface that delivers more than 5GB per second of memory bandwidth. Matrox Odyssey XD offers developers a choice of application programming interfaces (APIs) and programming models. The board can be programmed using the award-winning, hardware-independent Matrox Imaging Library (MIL) or the Matrox Odyssey Native Library (ONL), each with royalty-free run-time environments. Developers are provided with high-level algorithms and the ability to distribute workload across multiple boards. Highly optimized for the Odyssey family's onboard processors, these software libraries are carefully tuned to exhibit low function call overhead, thereby maximising application efficiency and performance. In terms of board control, developers can either run their application remotely from the host PC, run it entirely on the board itself, or write their own custom functions for the Odyssey's onboard processors. Matrox Odyssey XD offers support for Windows 2000, Windows XP, Linux and QNX Neutrino.